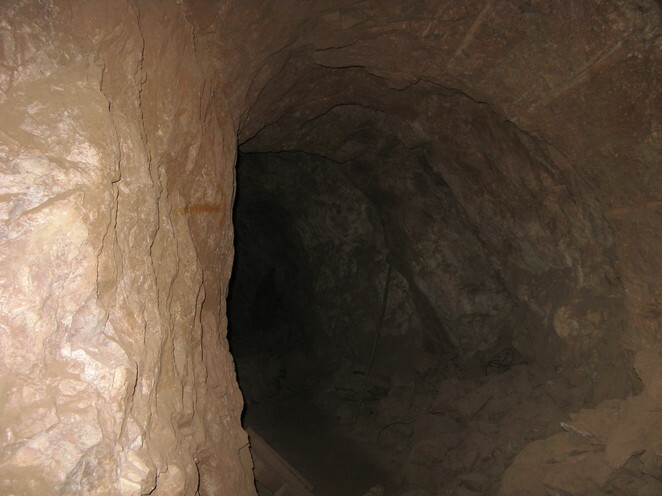 A Pb-Zn-Ag-Cu-Au-Mo mine located in sec. 30, T20S, R14E, East of Amado in the foothills of the Santa Rita Mountains at 4,224 feet of altitude (main adit). Originally claimed in 1907 but first significant production didn't occur until the 1950's. Owned at times, or in part, by Sheehy; Santa Cruz Silver-Lead Co.; Sunrise Mining Co.; Arivaca Mining Corp.; and the Colorado Fuel & Iron Steel Corp. NOTE: Coordinates updated February, 2008, using a Garmin hand held GPS unit (main adit portal) by Ronald Deblois. The latest name of this mine was derived from the fact that the best ore lined, or coated, the ends of tubes or ore chimneys, which resemble large fingers, just as a glove would cover the fingers of a hand. Mineralization is sulfides and quartz deposited in permeable zones at the intersection of a bedding plane fault and favorable beds in Permian Naco Group limestone. 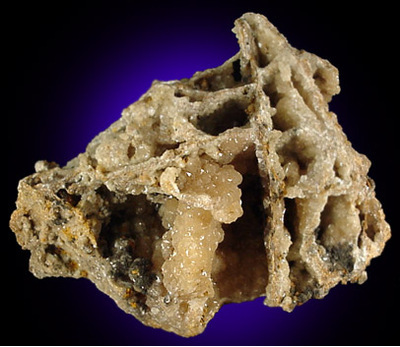 Extensive solution of the limestone and deep oxidation concentrated secondary minerals in the leached caverns as sand carbonate ore. Workings include shaft and adit operations. Worked at various times from about 1911 through 1972. The group produced some 29,260 tons of ore averaging about 22% Pb, 9% Zn, 7 oz. 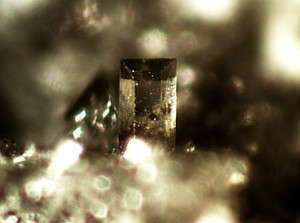 Ag/T, 0.3% Cu, and minor Au. CAUTION! 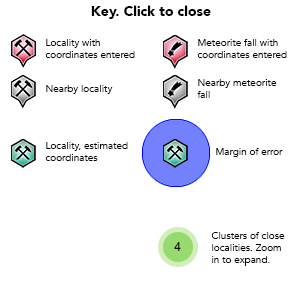 : This mine is under active claim (2011). Extensive cleanup efforts are currently underway in and around the mine to remove litter and debris from years of visitation. Heavy, reinforced gates have been installed on all of the adits and shafts to protect this historic locality. 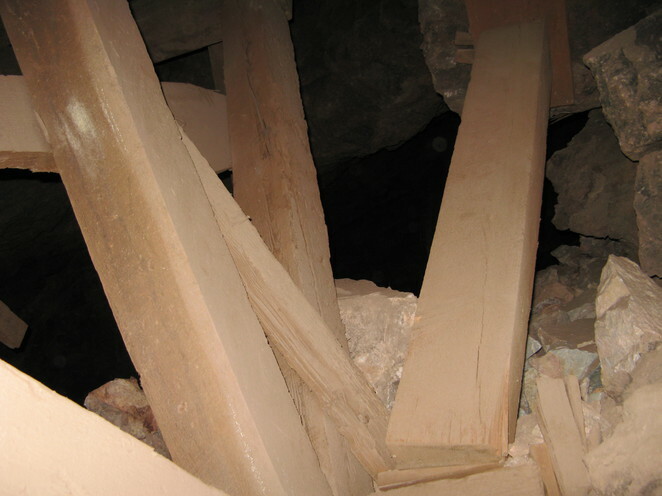 Recent fire caused by Forest Service contractors has unfortunately destroyed several structures in the mine, making much of the mine impassable. Efforts are also underway to restore ladders and supports in those areas. 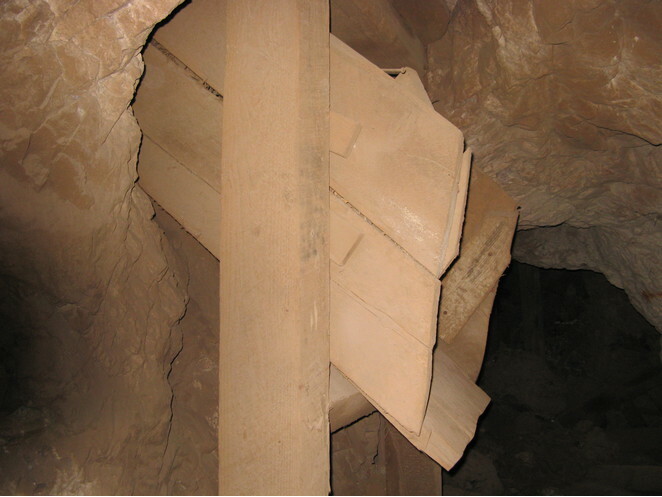 Once a timeline has been established and progress made in improving the safety of the mine, collecting by permission only may be considered by the claimant. Trespassing for the purpose of collecting is prohibited without the permission of the claim holders. 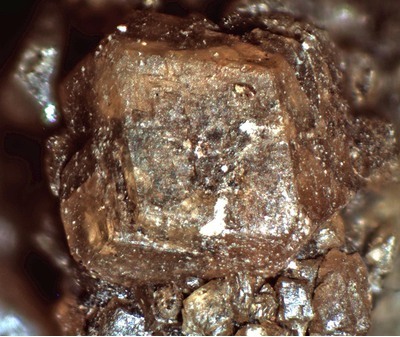 Description: Occurs in oxidized lead ore.
Reference: Anthony, J.W., et al (1995), Mineralogy of Arizona, 3rd.ed. : 112; Olson, H.J. (1966), Oxidation of a sulfide body, Glove mine, Santa Cruz Co., AZ, Econ.Geol. : 61: 731-743; Bideaux, R.A., et al (1960), Some new occurrences of minerals of Arizona, AZ Geol. Soc. Digest: 3: 53-56; Rocks & Min. :65:17,25; Min.Rec. :20(5):391 & 21:98. 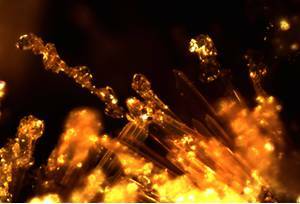 Description: Occurs as yellow-stained clusters of crystals; coralloidal material in naturally cavernous areas. Reference: Anthony, J.W., et al (1995), Mineralogy of Arizona, 3rd.ed. : 152. 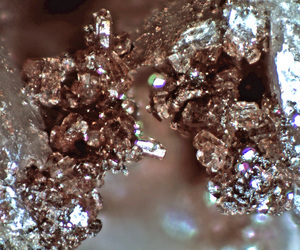 Description: Occurs as large crystalline masses. Reference: Anthony, J.W., et al (1995), Mineralogy of Arizona, 3rd.ed. : 112, 159; Olson, H.J. (1966), Oxidation of a sulfide body, Glove mine, Santa Cruz Co., AZ, Econ.Geol. : 61: 731-743; Bideaux, R.A., et al (1960), Some new occurrences of minerals of Arizona, AZ Geol. Soc. Digest: 3: 53-56. Reference: Anthony, J.W., et al (1995), Mineralogy of Arizona, 3rd.ed. : 168. Reference: Anthony, J.W., et al (1995), Mineralogy of Arizona, 3rd.ed. : 174; Olson, H.J. 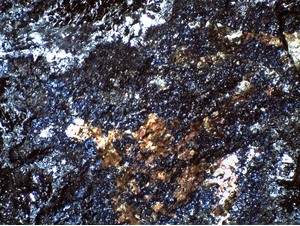 (1966), Oxidation of a sulfide body, Glove mine, Santa Cruz Co., AZ, Econ.Geol. : 61: 731-743. 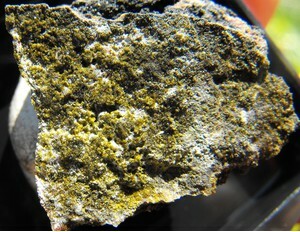 Description: As botryoidal crusts and pseudomorphs after wulfenite. Reference: Anthony, J.W., et al (1995), Mineralogy of Arizona, 3rd.ed. : 189; Min.Rec. : 14: 299-306. 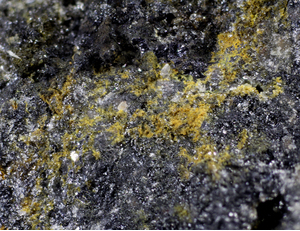 Description: Occurs pseudomorphous after wulfenite with calcite. Reference: Anthony, J.W., et al (1995), Mineralogy of Arizona, 3rd.ed. : 195. Reference: Anthony, J.W., et al (1995), Mineralogy of Arizona, 3rd.ed. : 215; Olson, H.J. 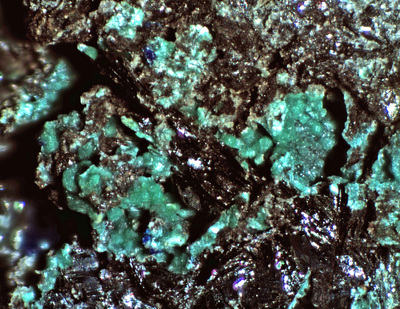 (1966), Oxidation of a sulfide body, Glove mine, Santa Cruz Co., AZ, Econ.Geol. : 61: 731-743. Reference: Anthony, J.W., et al (1995), Mineralogy of Arizona, 3rd.ed. : 229; Olson, H.J. (1966), Oxidation of a sulfide body, Glove mine, Santa Cruz Co., AZ, Econ.Geol. : 61: 731-743; Rocks & Min. : 65: 17,25; Min.Rec. : 20(5): 391; Min.Rec. : 21:98. 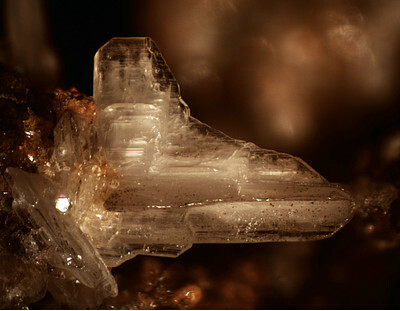 Description: Occurs as a secondary mineral. Reference: Anthony, J.W., et al (1995), Mineralogy of Arizona, 3rd.ed. : 242; Olson, H.J. (1966), Oxidation of a sulfide body, Glove mine, Santa Cruz Co., AZ, Econ.Geol. : 61: 731-743. 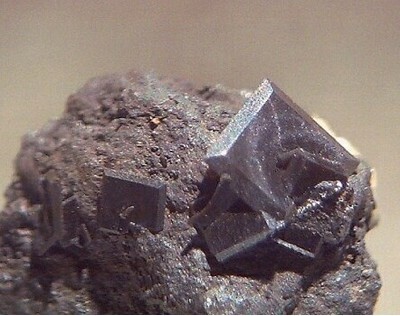 Description: Occurs as a constituent of fine-grained, brownish manganese oxides. Reference: Anthony, J.W., et al (1995), Mineralogy of Arizona, 3rd.ed. : 244; Olson, H.J. 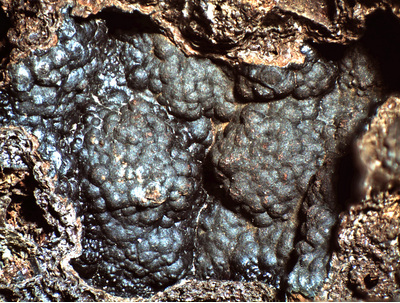 (1966), Oxidation of a sulfide body, Glove mine, Santa Cruz Co., AZ, Econ.Geol. : 61: 731-743; Bideaux, R.A., et al (1960), Some new occurrences of minerals of Arizona, AZ Geol. Soc. Digest: 3: 53-56. 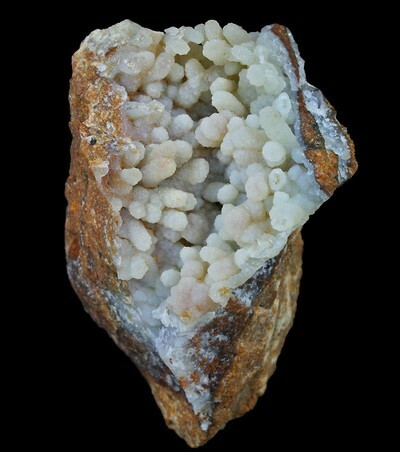 Description: Self collected in quartz on dumps of the Glove Mine. Reference: Anthony, J.W., et al (1995), Mineralogy of Arizona, 3rd.ed. : 289; Olson, H.J. 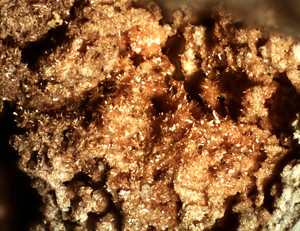 (1966), Oxidation of a sulfide body, Glove mine, Santa Cruz Co., AZ, Econ.Geol. : 61: 731-743. Description: Occurs replacing and forming incrustations on wulfenite. 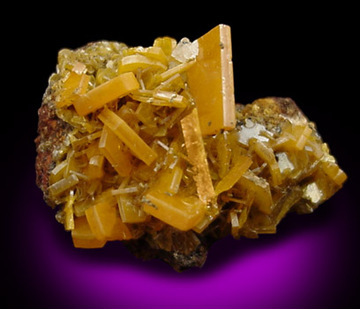 Description: Occurs as crystals on wulfenite. Reference: Anthony, J.W., et al (1995), Mineralogy of Arizona, 3rd.ed. : 331; Galbraith, F.W. & D.J. 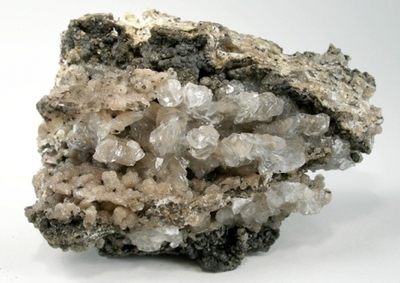 Brennan (1959), Minerals of AZ: 32. Reference: Anthony, J.W., et al (1995), Mineralogy of Arizona, 3rd.ed. : 339; Olson, H.J. (1966), Oxidation of a sulfide body, Glove mine, Santa Cruz Co., AZ, Econ.Geol. : 61: 731-743. Reference: Anthony, J.W., et al (1995), Mineralogy of Arizona, 3rd.ed. : 343; Olson, H.J. 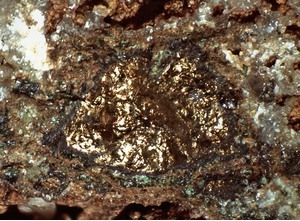 (1966), Oxidation of a sulfide body, Glove mine, Santa Cruz Co., AZ, Econ.Geol. : 61: 731-743. Reference: Anthony, J.W., et al (1995), Mineralogy of Arizona, 3rd.ed. : 349; Olson, H.J. 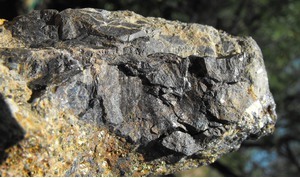 (1966), Oxidation of a sulfide body, Glove mine, Santa Cruz Co., AZ, Econ.Geol. : 61: 731-743. 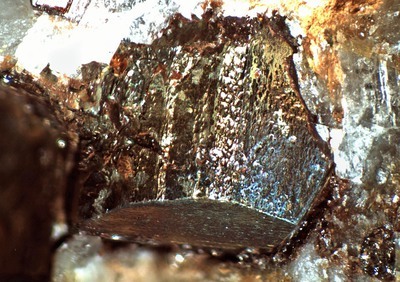 Description: Occurs with manganese oxide minerals. Reference: Anthony, J.W., et al (1995), Mineralogy of Arizona, 3rd.ed. : 350; Olson, H.J. (1966), Oxidation of a sulfide body, Glove mine, Santa Cruz Co., AZ, Econ.Geol. : 61: 731-743. Reference: Anthony, J.W., et al (1995), Mineralogy of Arizona, 3rd.ed. : 357; Olson, H.J. (1966), Oxidation of a sulfide body, Glove mine, Santa Cruz Co., AZ, Econ.Geol. : 61: 731-743. Reference: Anthony, J.W., et al (1995), Mineralogy of Arizona, 3rd.ed. : 370-371; Olson, H.J. (1966), Oxidation of a sulfide body, Glove mine, Santa Cruz Co., AZ, Econ.Geol. : 61: 731-743. Description: Occurs as gray balls. Reference: Anthony, J.W., et al (1995), Mineralogy of Arizona, 3rd.ed. : 374-375, 411; Olson, H.J. (1966), Oxidation of a sulfide body, Glove mine, Santa Cruz Co., AZ, Econ.Geol. : 61: 731-743. Description: Abundant as incrustations in intermediate zone of the replacement orebodies in limestone. Reference: Anthony, J.W., et al (1995), Mineralogy of Arizona, 3rd.ed. : 378; Olson, H.J. (1966), Oxidation of a sulfide body, Glove mine, Santa Cruz Co., AZ, Econ.Geol. : 61: 731-743; Rocks & Min. : 65: 17,25; Min.Rec. : 20(5): 391; Min.Rec. : 21: 98. Description: Occurs with wulfenite & smithsonite. Reference: Anthony, J.W., et al (1995), Mineralogy of Arizona, 3rd.ed. : 411; Olson, H.J. 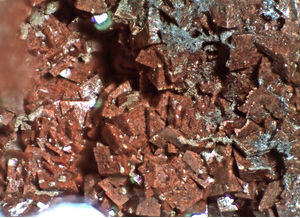 (1966), Oxidation of a sulfide body, Glove mine, Santa Cruz Co., AZ, Econ.Geol. : 61: 731-743. Reference: Collection of Tom Trebisky, verified with Raman. 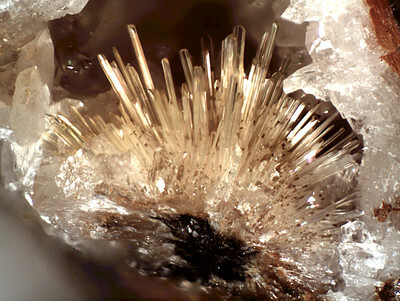 Habit: Crystals to 4 inches, or more (10 cm) on an edge. Reference: Anthony, J.W., et al (1995), Mineralogy of Arizona, 3rd.ed. : 112, 189, 331, 411, 426; Olson, H.J. (1966), Oxidation of a sulfide body, Glove mine, Santa Cruz Co., AZ, Econ.Geol. : 61: 731-743; Bideaux, R.A., et al (1960), Some new occurrences of minerals of Arizona, AZ Geol. Soc. Digest: 3: 53-56; Galbraith, F.W. & D.J. 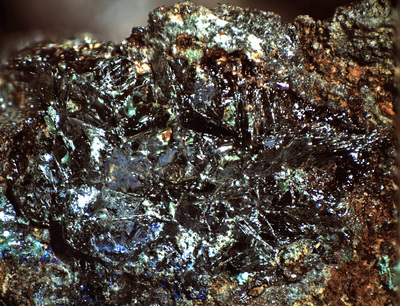 Brennan (1959), Minerals of AZ: 70, 80; Min.Rec. : 3: 198-199; 14: 299-306. Schrader, F.C. (1915) Mineral deposits of the Santa Rita and Patagonia Mountains, Arizona, with contributions by J.M. Hill: U.S. Geological Survey Bulletin 582, 373 p., 3 sheets, scale 1:125,000: 185. Anthony, J.W. (1951) Geology of the Montosa-Cottonwood Canyons Area, Santa Cruz County, Arizona: Tucson, University of Arizona, M.S. thesis, 84 p.
Galbraith, F.W. & D.J. Brennan (1959), Minerals of Arizona: 32, 70, 80. Bideaux, R.A., et al (1960), Some new occurrences of minerals of Arizona, Arizona Geological Society Digest: 3: 53-56. See, J.M. (1964) Origin and distribution of molybdenum in the vicinity of the Glove Mine, Santa Cruz County, Arizona: Tucson, University of Arizona, M.S. 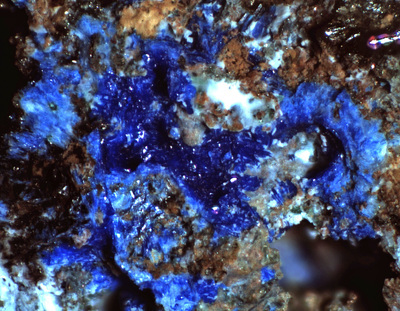 thesis, 89 p.
Rocks & Minerals (1990): 65: 17, 25. Arizona Bureau of Mines file data. Olson, H.J. 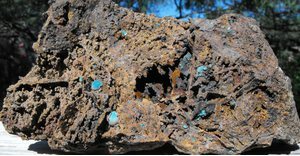 (1966), Oxidation of a sulfide body, Glove mine, Santa Cruz County, Arizona, Economic Geology: 61: 731-743. Keith, Stanton B. (1975), Arizona Bureau of Mines Bull. 191, Index of Mining Properties in Santa Cruz County Arizona: 85 (Table 4). Anthony, J.W., et al (1995), Mineralogy of Arizona, 3rd. ed. : 112, 152, 159, 168, 174, 189, 195, 215, 229, 242, 244, 289, 299, 339, 343, 349, 350, 357, 370-371, 374-375, 378, 411, 426.